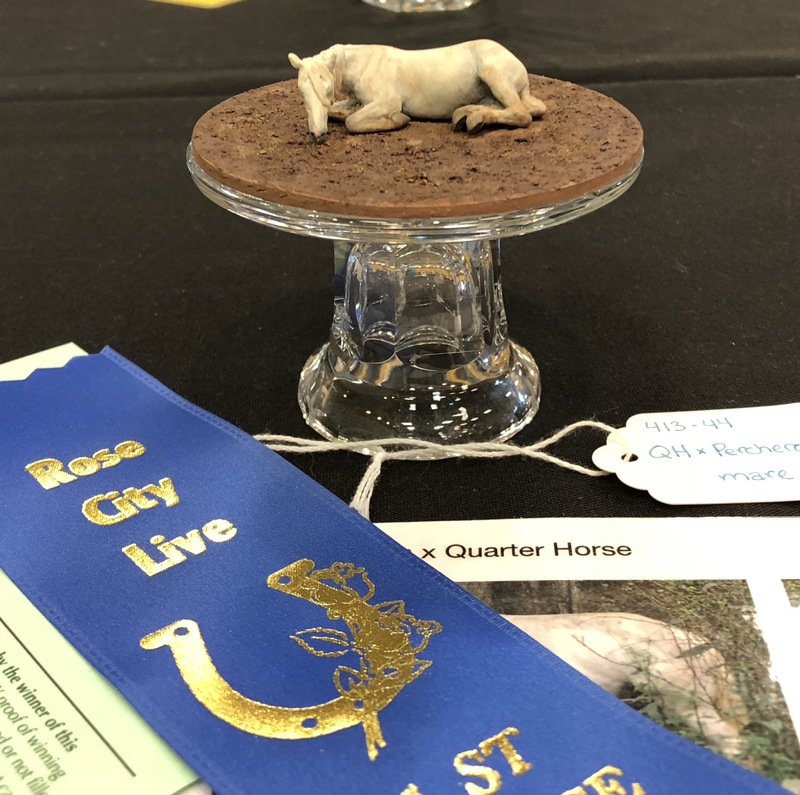 Earlier this month I attended one of my favorite show, Rose City Live. I’m totally spoiled to have a show like this every year just 15 minutes from home. Showholder Vicky Harms always does a great job putting on a fun, well organized show. 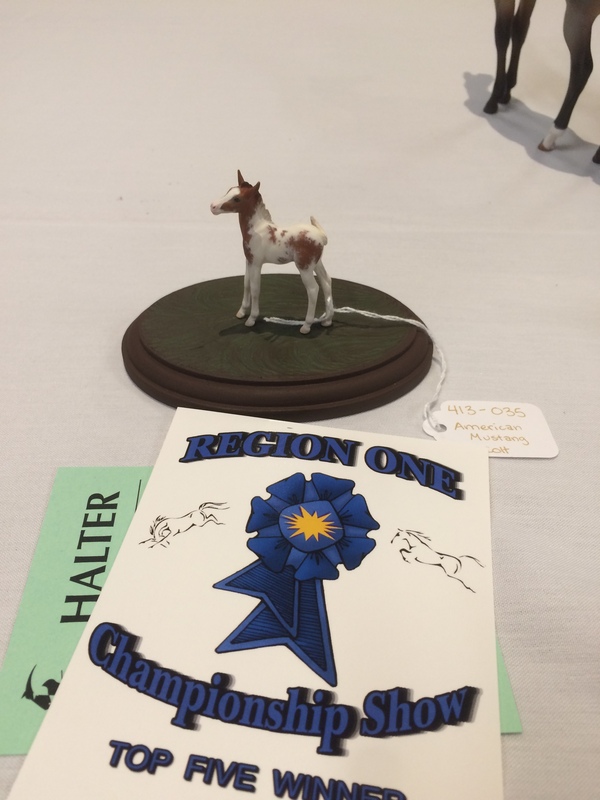 This year I judged performance and then showed halter in the afternoon. 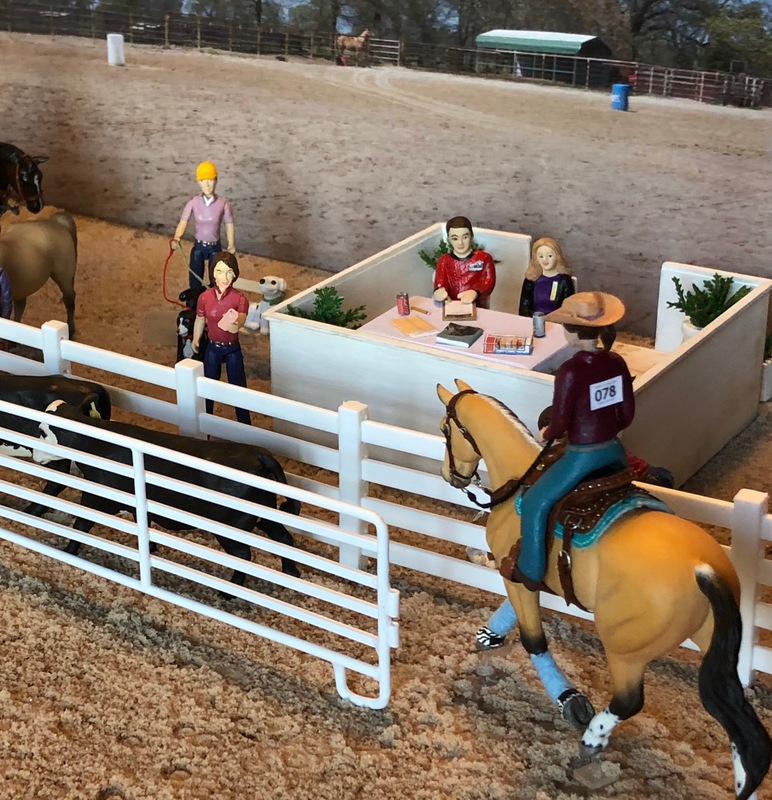 Performance was relatively small, so between classes I entertained myself by helping call classes for other judges, hawking Erin’s sale horses, and oogling other people’s entries. 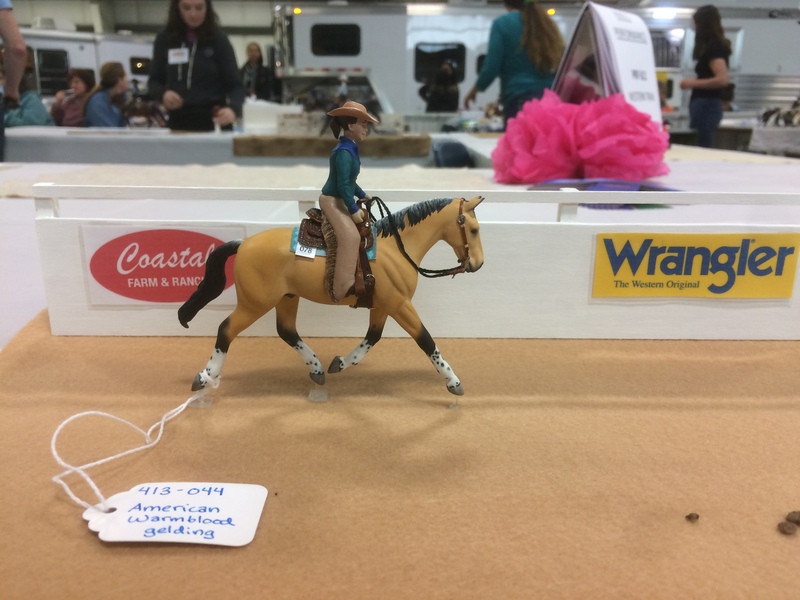 I just finished a new horse- Maggie Bennett’s micro mini cob, Rockwell. I painted him as a surprise gift for Maggie, but he was done just in time for the show so I had to bring him! My micros had a stellar day overall. 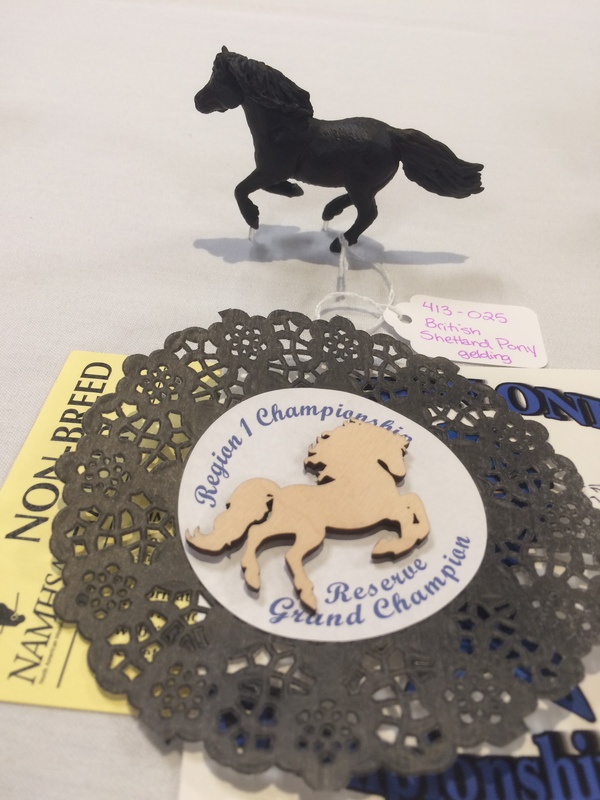 Thumbelina was AR Reserve Champion Draft/Pony/Other and Dirt Nap took first in AR Mix Breed Draft. 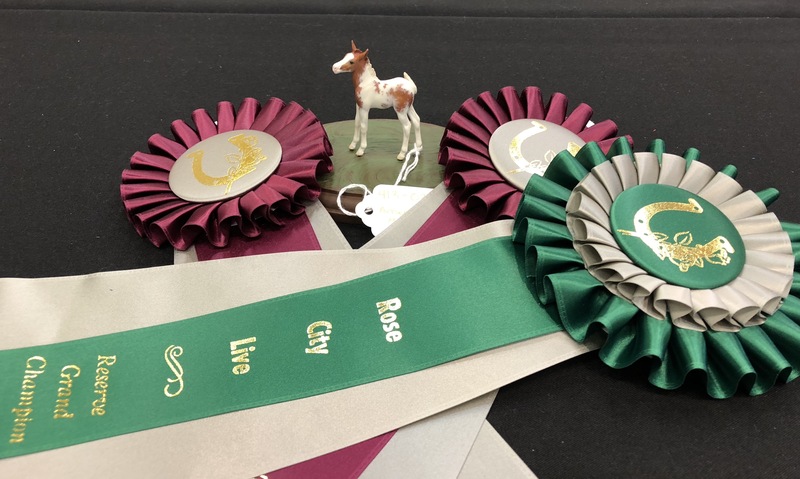 The biggest surprise of the day was Hovito being pinned AR Reserve Champion Stock Breed, AR Reserve Champion Pattern/Other Workmanship, and then Overall Reserve Champion Resin! 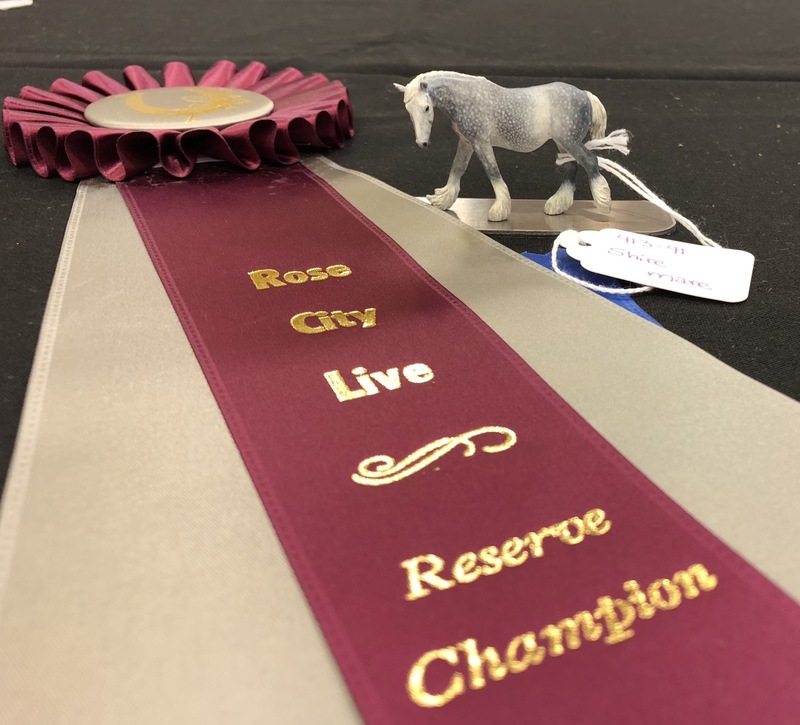 I have never, ever had a horse get a rosette in breed and workmanship at the same show, let alone go on to earn an overall! 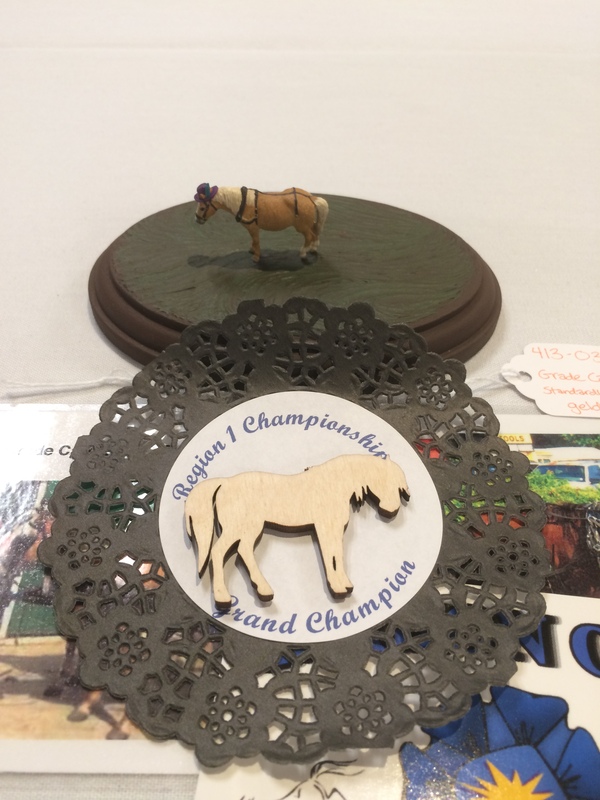 By the time this championship was pinned I had started packing up my table, and for a long time I didn’t even notice what happened. It didn’t even occur to me that I might have won- I just knew I needed to go pick up my horse later. When I did finally look I was absolutely speechless! It was a stupendous ending to a wonderful show! 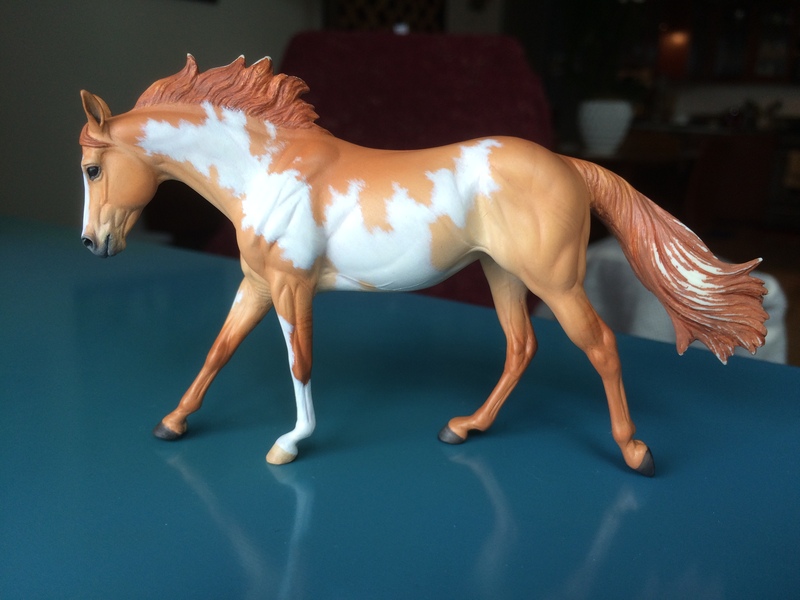 Now that she’s been delivered to her owner, I’m happy to share that the red dun overo Moxie is finished! 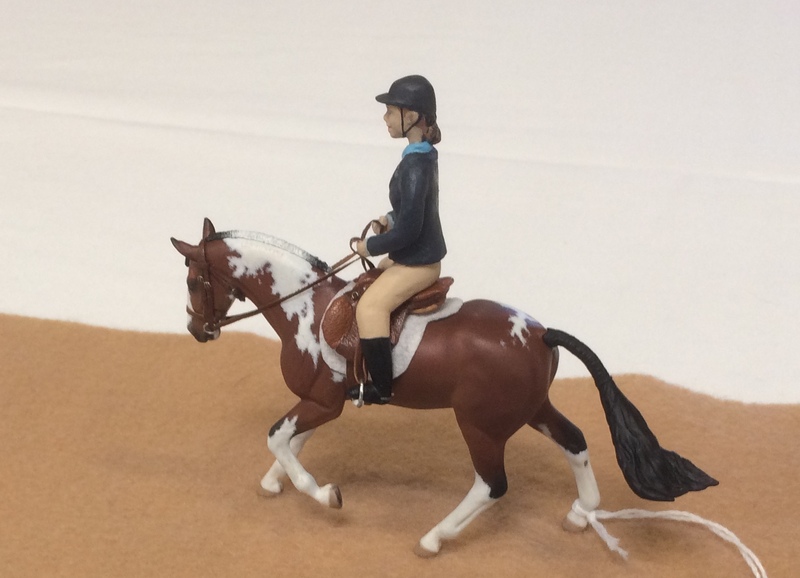 I was able to get her done in time for her to be delivered as a surprise to her (very patient) owner at Breyerfest. 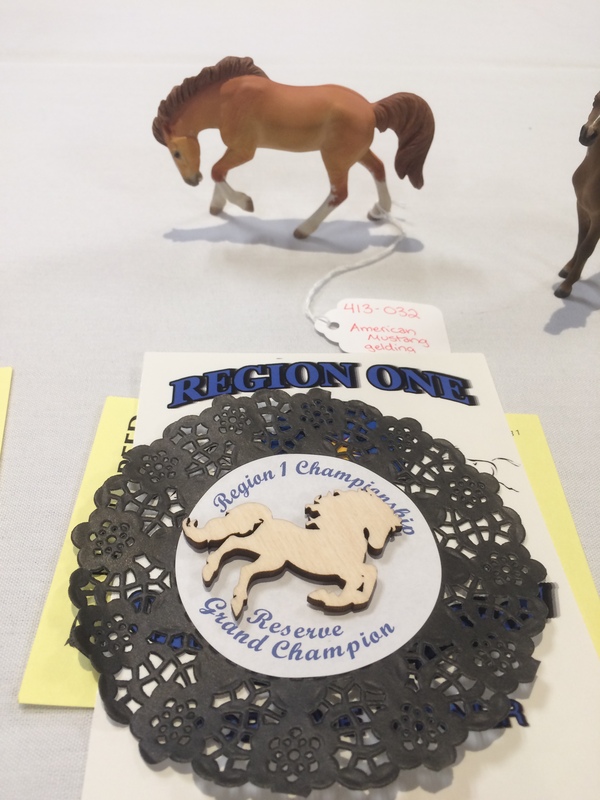 My most recent live show was the long awaited Region 1 Championship Show in Kennewick, Washington. 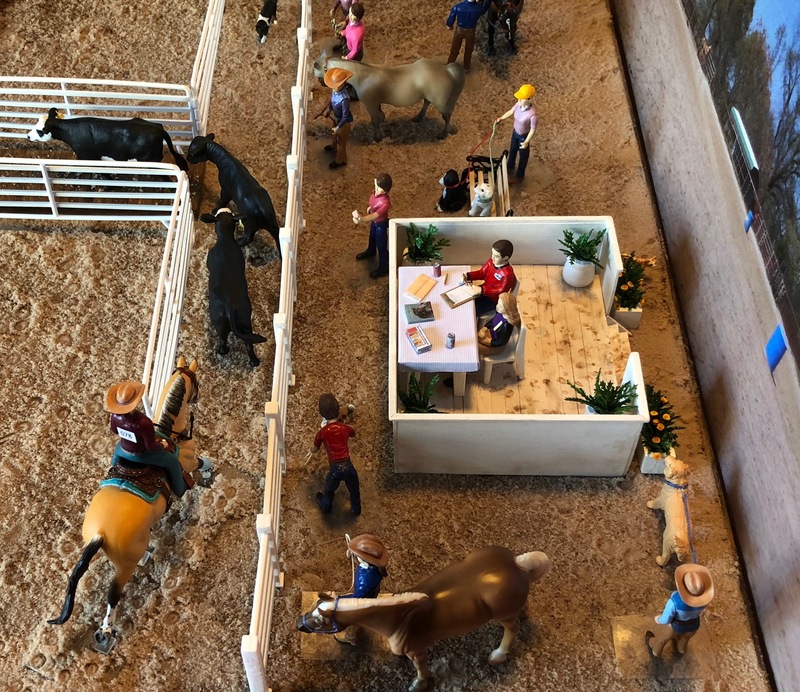 Our NAMHSA rep- who is also an avid show holder- has been fundraising for several years to get this show off the ground. I’m really glad I made the trek out to attend. 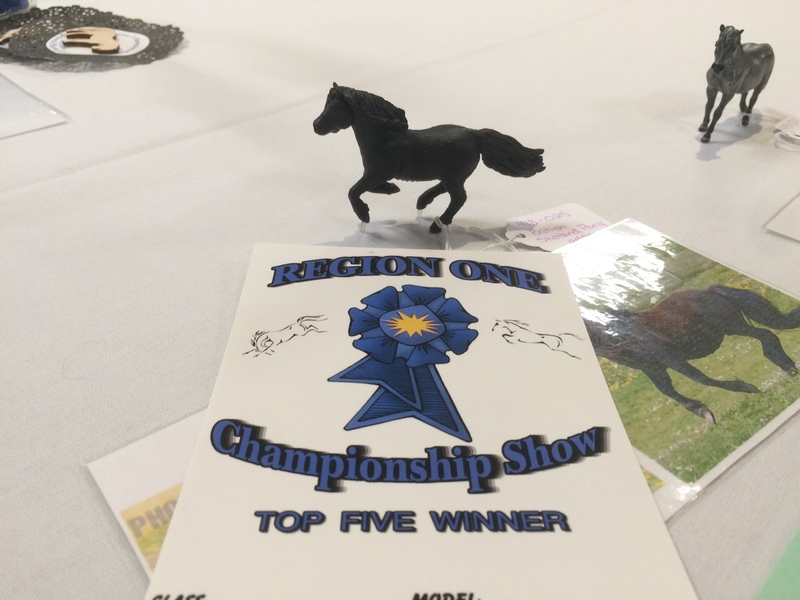 This show was open to model horses who had won a NAN card at a Region 1 show in the last five years. 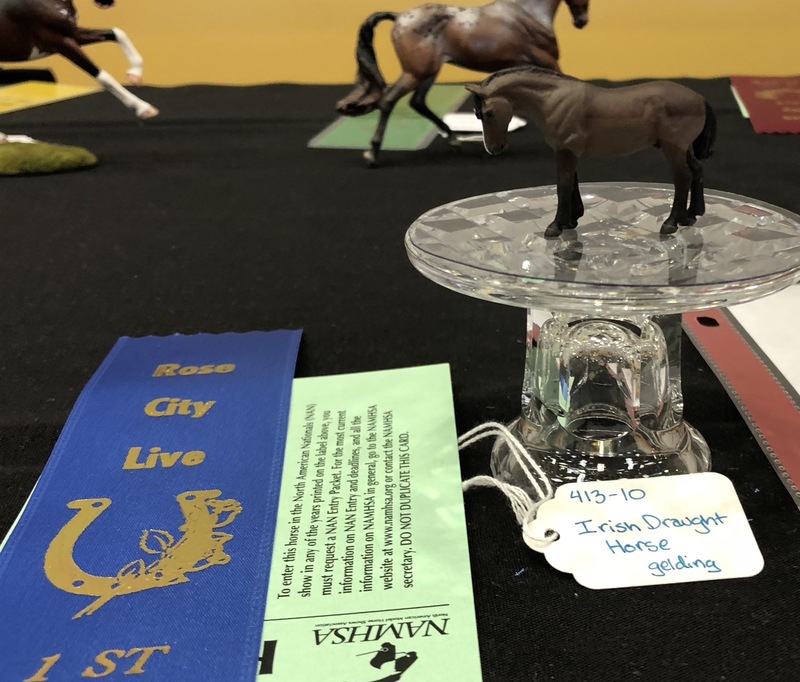 It was different from a standard show in that we had to put the horse on the table with their NAN card (so that the stewards could confirm eligibility) but the winners did not earn new NAN cards. 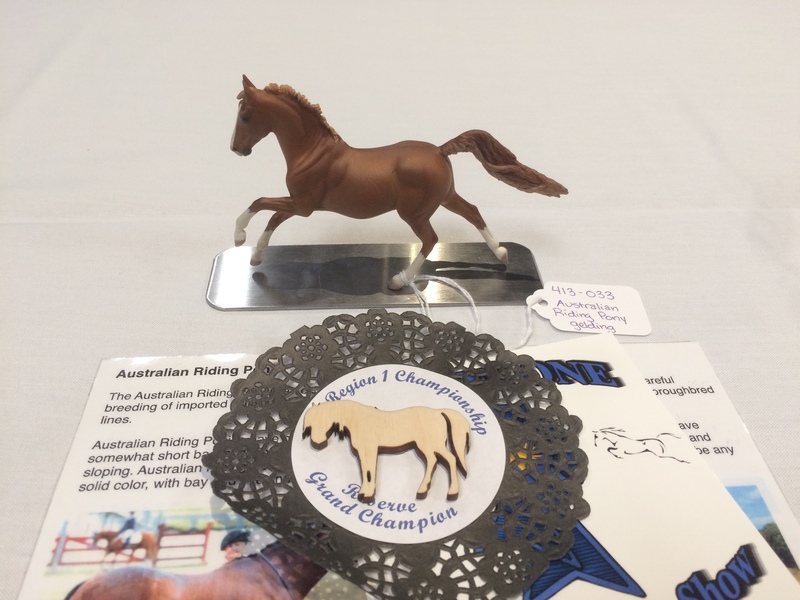 The halter divisions had a good turn out with many lovely horses from all around the region. I was very chuffed to earn a few “cookies” of my own, as well as a number of Top Fives. 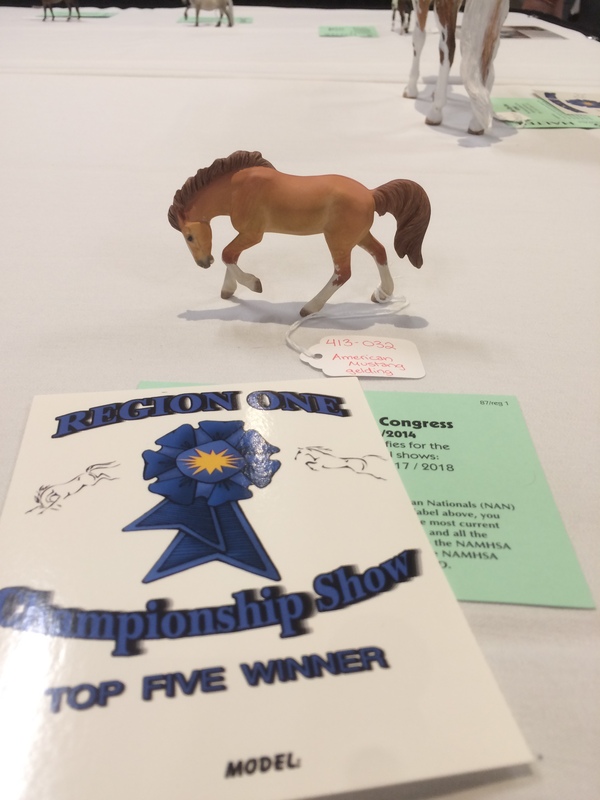 August P. Hattington surprised me by winning Champion of the carriage breeds class. 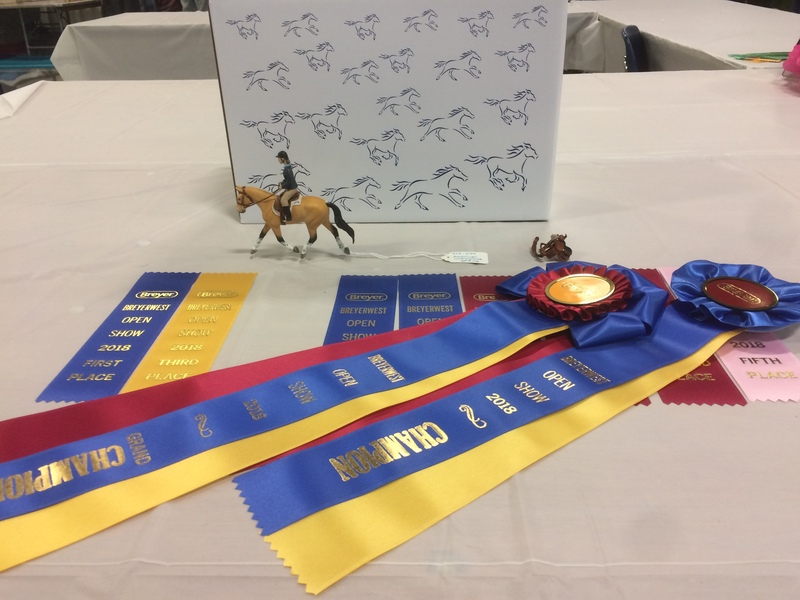 Tater Bug surprised me by winning Reserve Champion in a very large custom dilutes class. I also showed in performance, but unfortunately I was one of the only entrants. Performance has been having very low turnout in our region in the last few years, which is really sad. It’s much more fun to show (and judge!) when you have full classes. 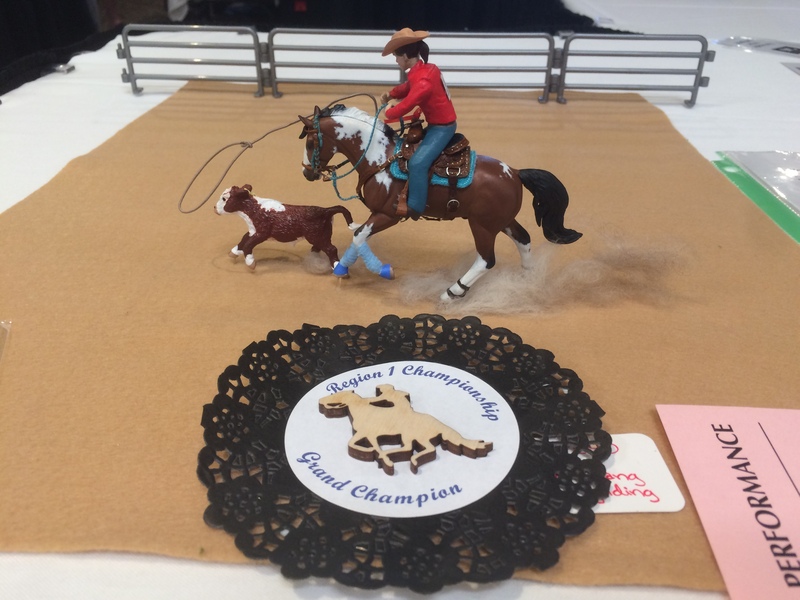 Unfortunately, in most of the champ show classes I was only showing against myself. That said, it was fun to get RoboClop out again- especially now that he is actually done and has his pinto spots. The low turnout also sparked some good conversation about how we can hopefully encourage more people to show performance and hopefully revive it. PHF Richard Squared in English Trail with my cute new welcome kitty props. My focus for the last few weeks has been two trade-commissions I have in progress. 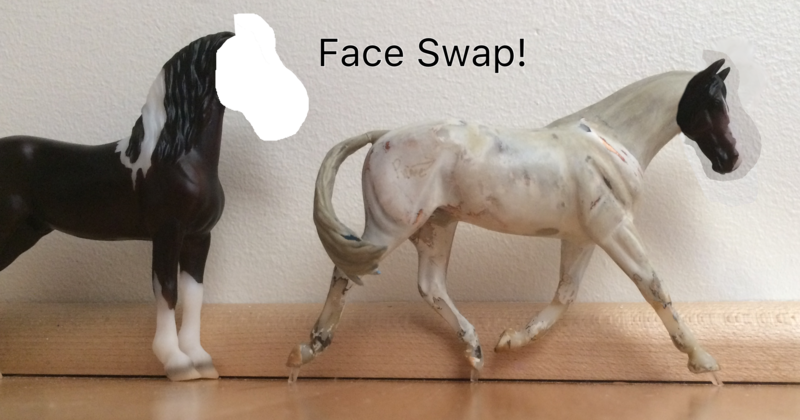 I’m very eager to get both of these horses back to their owners with their new paint jobs. First up is this Moxie resin (sculpted by Sarah Rose). She’s very close to finished as a red dun overo. She still needs her mane and tail painted and other acrylic details, but her body color- acrylic markings over oils- is done (and dun!). Next to Moxie on the shelf is this Mini Hazel resin (by Morgen Kilbourn). I had always loved the traditional sized Hazel resin so I was very excited when Morgen cast her in mini size. I am painting this one to a deep dark bay. I wish she was easier to photograph- I’ve done many layers (more than I’d anticipated!) on the way to capturing the purpleish and gold tones of the reference picture. She still has more oils work to go and will be finished up with some minimal whites. The other piece demanding my attention is my newest performance horse, RoboClop. I showed him at BreyerWest as a solid bay, but he was always meant to be a pinto like my reference picture. I finally got his markings on and I’m really pleased with how they came out. I’ve had a few weekends away but I’m looking forward to a more low key weekend coming up- with lots of time set aside for painting. 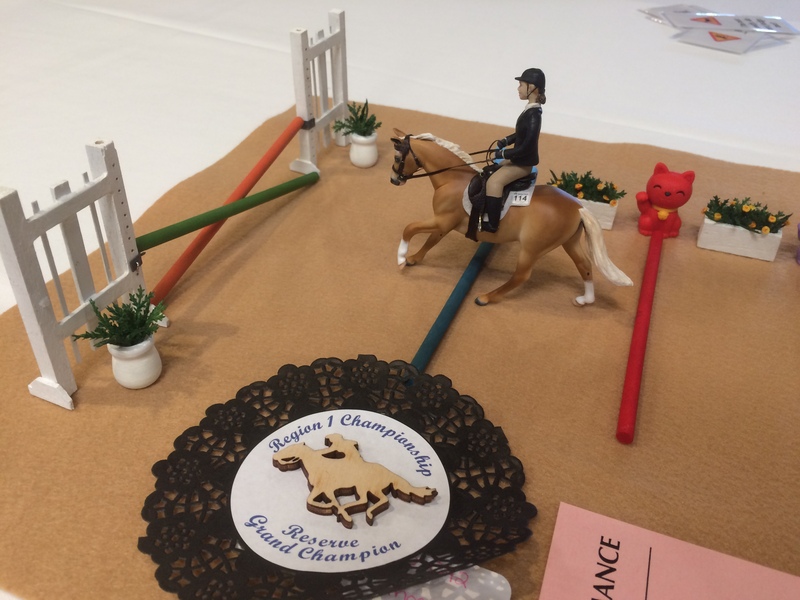 Most of my hobby time since January was spent preparing for BreyerWest- customizing and painting RoboClop, making tack and props, and obsessively planning my classlist. Back in the studio now, I’ve got a number of fun projects in the works. 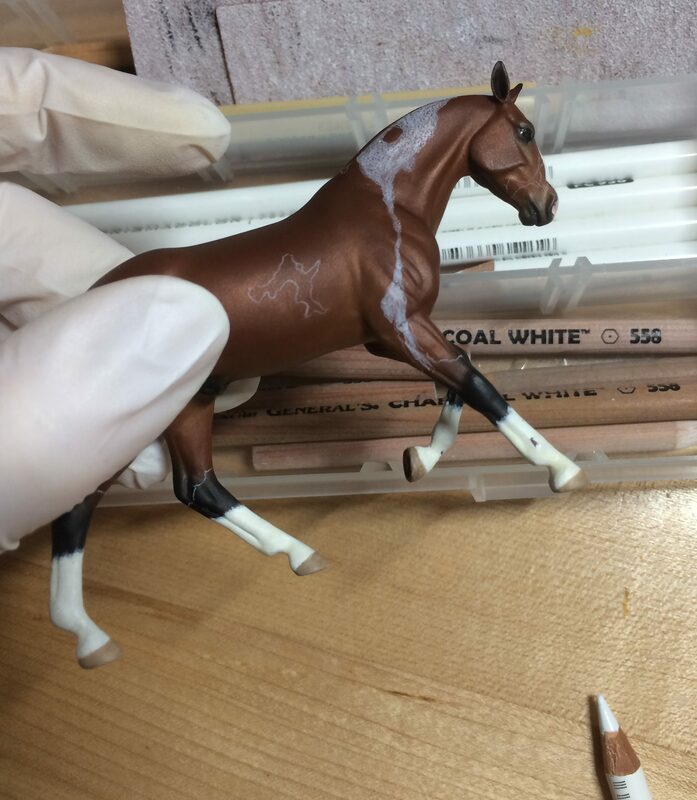 I’ve got two trade-commissions going: Hazel needs a few more coats of oils and her markings, while Moxie is getting her pinto pattern and acrylic details. 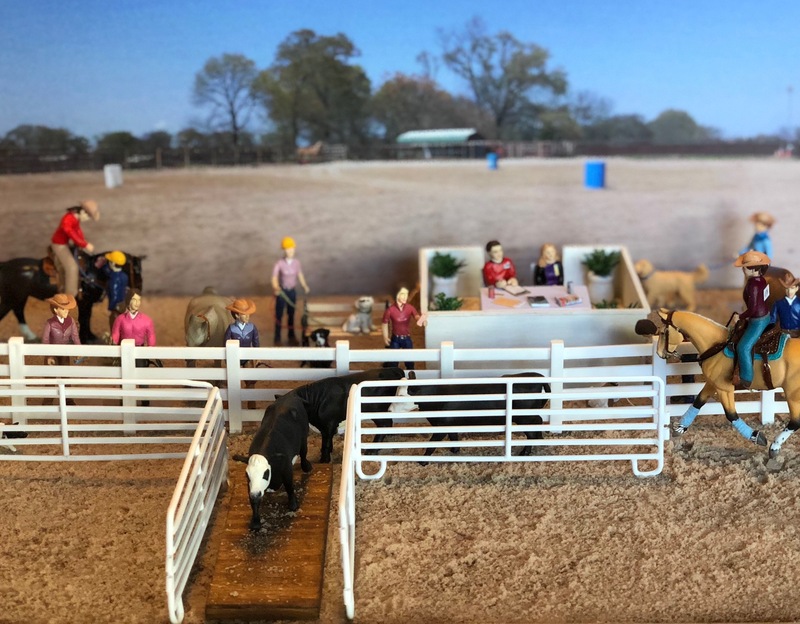 I bought two of Maggie Bennett‘s fantastic resin micros at BreyerWest, one of which is half painted and the other of which I have grand plans for. On the right are two new horses (a CM and a resin) that I had just started in oils when the BreyerWest madness really took hold. 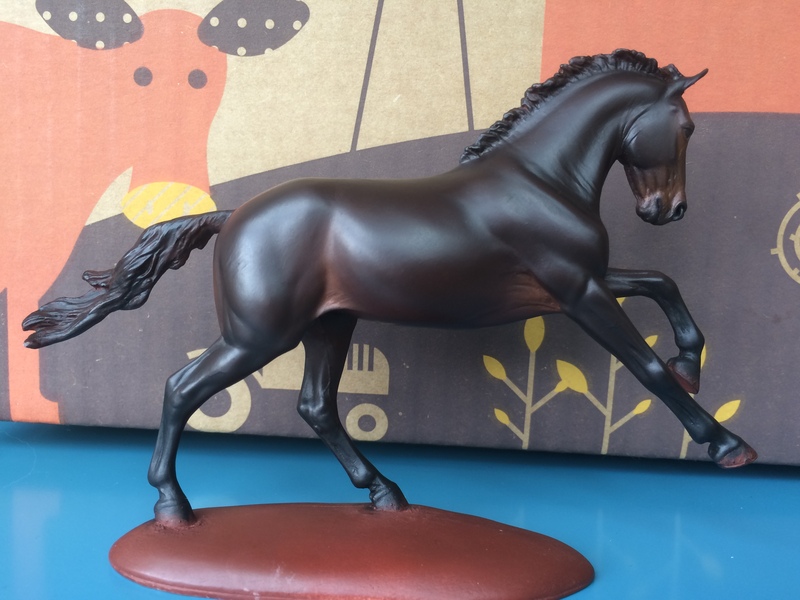 One thing that didn’t get done in time for BreyerWest was RoboClop’s pinto coat. He showed as a pretty bay with high whites, but he was always destined to be a tobiano. He got a bath to take off the sticky wax and now he’s getting his markings mapped on in colored pencil before I start layers of acrylics. 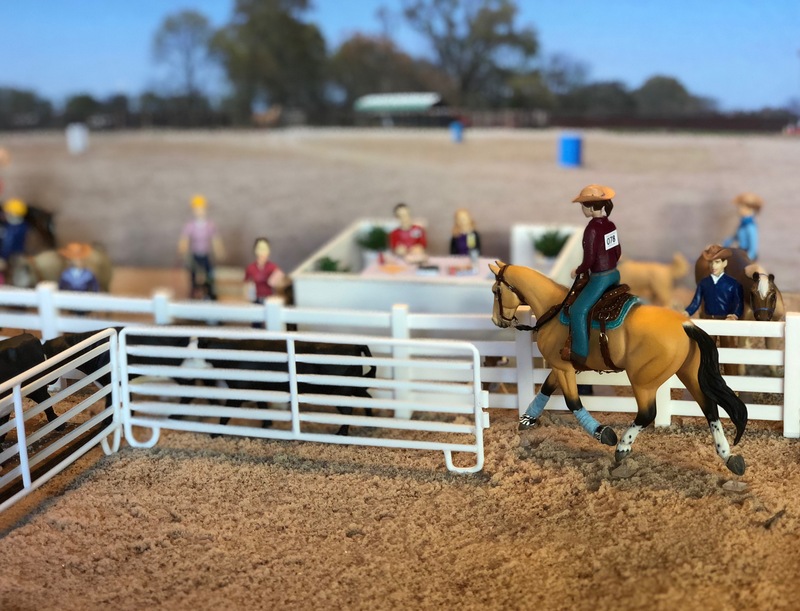 I’m loving having the new micros to work on- I like to do micros primarily in acrylics, and it’s fun to work on them between coats on other horses. 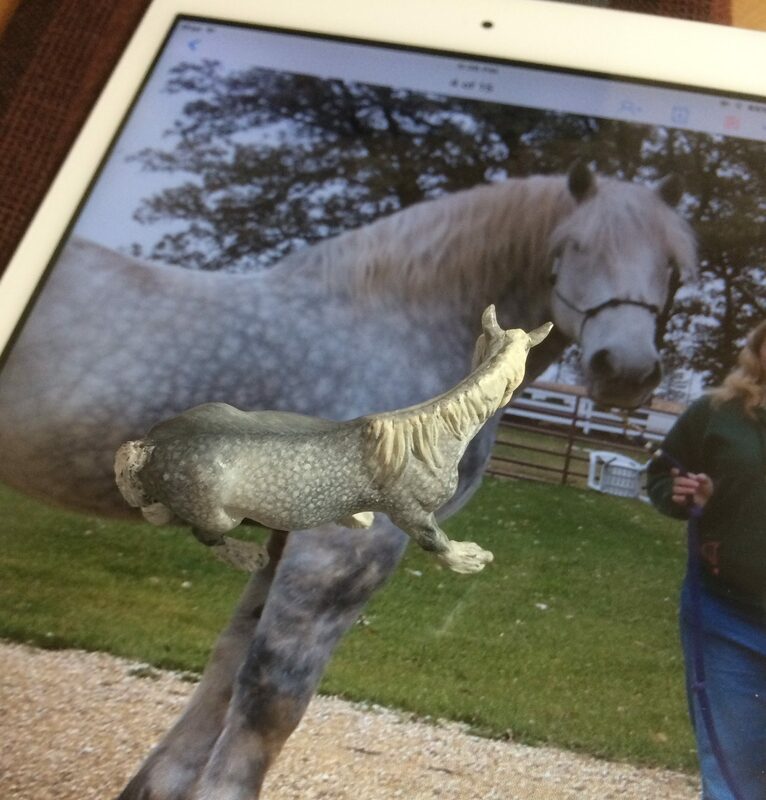 This fantastic little sculpt is called Bambi, and she’s currently half dappled grey. Sitting on my iPad with my main reference picture. Lots of good fun in the future for me! Just one little thing delaying my work… I’m about to fly to Italy for a three week vacation :D Wheeeeee!